Former First Lady Laura Bush took members of her family, including her new son-in-law Craig Coyne, on a tour of the White House while the family was in Washington for George H.W. Bush’s funeral. Laura Bush and husband George W. Bush lived in the White House from 2001 to 2009. 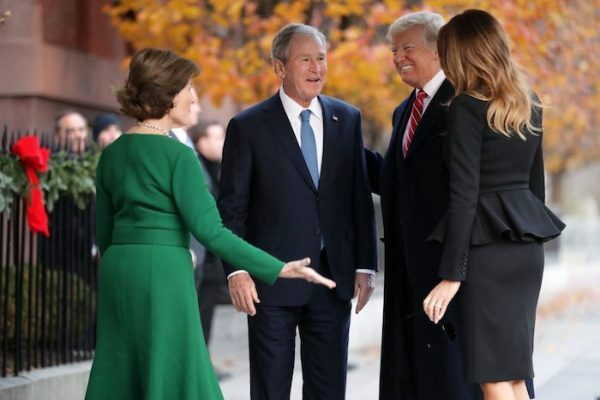 Bush, 72, accepted an invitation by current First Lady Melania Trump to visit the building and see the holiday decorations that Trump and a host of volunteers put up recently. “A sweet visit during this somber week,” Bush wrote on Instagram, posing with 20 of her relatives in front of the portrait of H.W. Bush. Several grandchildren also attended the tour, in addition to former first daughter Dorothy Bush Koch and Barbara Bush, one of George W. Bush and Laura Bush’s twin daughters who married Coyne earlier this year. President Donald Trump said earlier on Monday that Laura Bush would be visiting the White House and given a tour of the Christmas decorations by Melania Trump. Laura Bush and George W. Bush met with the president and first lady outside the Blair House after the tour. Pictures showed the couples meeting and exchanging pleasantries ahead of H.W. 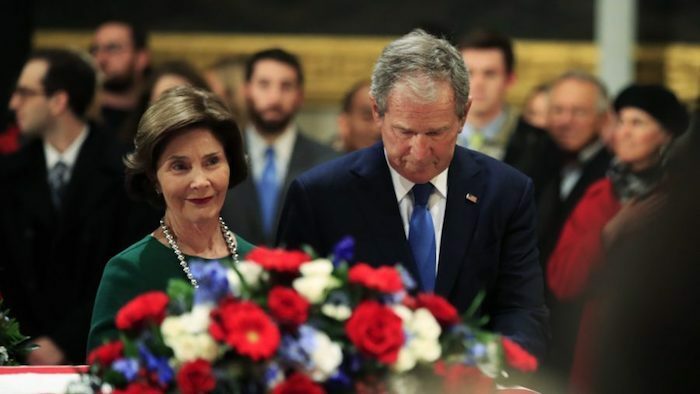 Bush’s Dec. 5 funeral, which was slated to start at 11 a.m. Later on Dec. 4, the former president and former Florida Gov. Jeb Bush, along with their wives and Jenna and Barabara Bush, met with mourners who were paying tribute to their father. After the funeral, the casket bearing the former president will be taken to Houston, Texas, for a viewing. 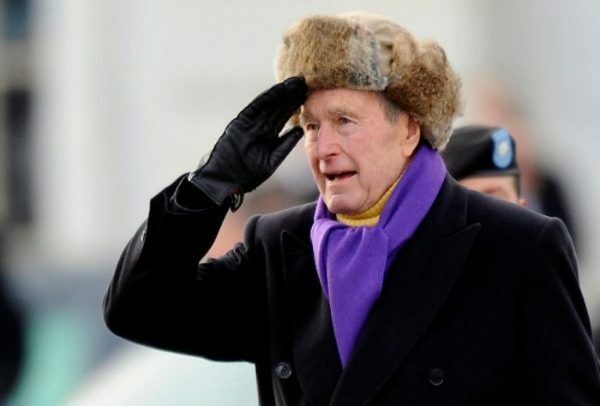 Bush will be buried at the George H.W. Bush Presidential Library and Museum after a ceremony at the Texas A&M University on Dec. 6. Bush, 94, died on Nov. 30. He was survived by five children and their spouses, 17 grandchildren, eight-great grandchildren, and two siblings. The president and his wife stood in front of the casket with their eyes closed before the 45th president saluted the casket and the pair exited the rotunda at the U.S. Capitol. Trump posted a video of the welcoming ceremony on his Twitter feed, and it’s received millions of views.